What is a Windows Update policy? The Datto RMM Windows Update policy is designed to allow Datto RMM to control the Windows Update settings found in the Control Panel of Windows devices. Setting up a Windows Update policy allows you to control these settings on multiple devices in multiple sites, instead of just one. Windows Update policies can be created at the Account or Site level. Refer to Create a policy. With Windows Update enabled, you allow Microsoft to control the installation of patches. However, if you are using a Patch Management policy to install only the patches you have selected, you do not want the automatic settings of Windows Update installing patches you have not approved. Therefore, you must first disable Automatic Windows Updates. Refer to Disable automatic Windows Updates. Give the policy a Name. Select the type Windows Update. To copy an already existing policy to use it as a template, choose it from the Based on drop-down list. To create a new policy, select New Policy. 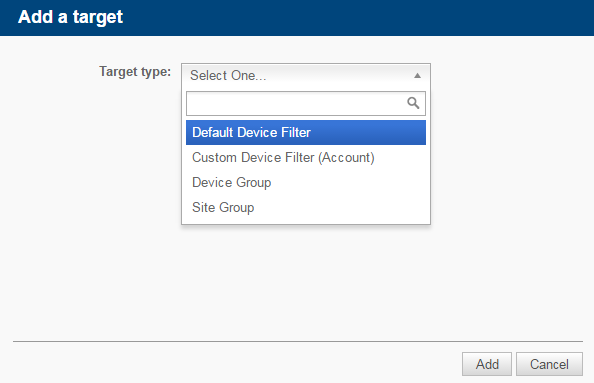 Click Add a target... to target your devices through a specific filter or group. If you want to target more than one filter or group, add another target to the policy. Multiple targets will apply the "OR" logic, that is, the policy will be run on a device if it is included in any of the targets. For more information about target types, refer to Filters and Groups. Filters will present you with a list of the device filters that are present in every account and any custom filters you've created yourself. Devices of Unknown device type will not be targeted by the policy. Configure the Universal Settings (all Windows versions) section. The screenshot below shows the default settings. • Give me updates for Microsoft products and check for new optional Microsoft software when updating Windows. - Selected by default. WSUS If you have set up a Windows Server Update Services (WSUS) server, it will act as a location for other Windows devices to pull updates from, rather than each device having to download Windows updates separately. It acts like a local cache, but only for Windows patches. • Do not allow any connections to Microsoft for Patching or Searching when using a WSUS Server. • Client-side Targeting Group Name - It specifies the target group name(s) that should be used to receive updates from an intranet Microsoft update service. If the setting is disabled, no target group information will be sent to the intranet Microsoft Update service. If the setting is enabled, you can enter a target group name or names separated by semicolons (if the intranet Microsoft update service supports multiple target groups). The specified target group information is then sent to the intranet Microsoft update service which uses it to determine which updates should be deployed to the device. Configure the Windows as a Service Settings. The screenshot below shows the default settings. These settings apply to devices adopting the Windows as a Service model (e.g. Windows 10). • Configure Active Hours - Selected by default. Once selected, specify what time Active Hours should begin (00:00-23:00 hours) and how long they should last for (1-18 hours). • Change Update Channel settings for applicable devices - Selected by default. This setting also enables device telemetry. Once selected, you'll be able to choose between targeted or broad deployment. • Broad Deployment: Updates are received later, after receiving community feedback (Current Branch for Business) - Selected by default. Once selected, you'll be able to configure update referral. • Defer Feature Updates - Selected by default. Once selected, specify if you want to Defer for the maximum time permissible according to OS Build (selected by default) OR Defer for a period as close as possible to X days (up to three numbers, integers only). • Defer Quality Updates - Selected by default. Once selected, specify if you want to Defer for the maximum time permissible according to OS Build (selected by default) OR Defer for a period as close as possible to X days (up to two numbers, integers only). If you choose the Defer for a period as close as possible to X days option, Datto RMM will defer to what the device's Windows version permits. Different versions of Windows have different maximum values. For example, if you enter 35 days but the device's Windows version only supports 28, the update will be deferred to 28 days. • Permit devices to share Windows Updates within local network - Once selected, the next option will become available as well. • Disable Windows Fast Startup - Selected by default. When selected, updates will be installed on shutdown as well as reboot (instead of only on reboot). Configure the Legacy Settings. The screenshot below shows the default settings. These settings apply to devices with an operating system older than Windows 10. • Automatically detect recommended updates for my computer and install them. • Download updates for me, but let me choose when to install them. • Notify me of updates, but do not automatically install them. • Turn off Automatic Updates. - Selected by default. When selected, the rest of the configuration options will be disabled and unchecked. For more information, refer to Disable automatic Windows Updates. Install new updates Allows you to select on which day and at what time you want to install the updates. • Give me recommended updates the same way I receive important updates. • Allow non-Administrative Endpoint Accounts to receive update notifications. • No auto-restart with logged on users for scheduled Automatic Updates installations. - If this setting is unchecked, Automatic Updates will notify the user that the computer will automatically restart in 5 minutes to complete the installations. If checked, Automatic Updates will wait for the computer to be restarted by any user who is logged on, instead of causing the computer to restart automatically. • Re-prompt for restart with scheduled installations. (Maximum 30 minutes) - If this setting is unchecked, the default delay of 10 minutes will be used. If the setting is enabled, the restart will occur the specified number of minutes after the previous prompt for restart was postponed. • Delay restart for scheduled installations. (Maximum 1440 minutes) - If this setting is unchecked, the default delay of 15 minutes will be used. If the setting is enabled, the restart will occur the specified number of minutes after the installation is complete. Click Save. The window will close, and you will be returned to the policy list page. To activate the policy, click Push changes. If you are using a Datto RMM Patch Management policy to install only the patches you have selected, you do not want the automatic settings of Windows Update installing patches you have not approved. The most elegant way to do that is to create a Windows Update policy to disable Automatic Windows Update on the devices you want to patch. Windows updates cannot be disabled on devices adopting the Windows as a Service model (e.g. Windows 10), however, you can configure various aspects of the updates (as discussed in the Windows as a Service Settings section in Specify the policy details for a Windows Update policy above). For more information about Windows 10 and Datto RMM Patch Management, refer to Patch Management and Windows 10. The steps below discuss how to disable Windows updates on devices not adopting the Windows as a Service model. Create a new Windows Update policy. Refer to the steps specified above. Uncheck all options in the Universal Settings (All Windows versions) section. You can leave or uncheck the default selections in the Windows as a Service Settings section as they will not apply. Under Legacy Settings > Configure Updates, select Turn off Automatic Updates. This will leave the rest of the options unchecked. You can then set up a Patch Management policy to ensure that you install the necessary patches on your devices. Refer to Create a Patch Management policy. Need to troubleshoot this? Open the Datto Knowledge Base. Forward this topic to others. Provide feedback for the Documentation team.